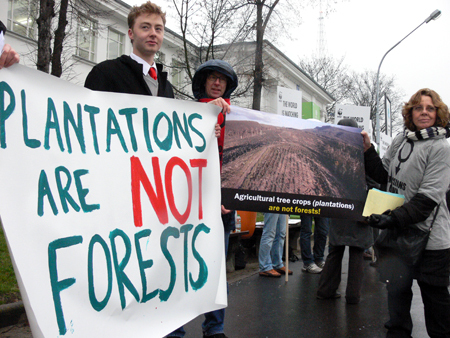 Poznan, Poland (UN Climate Conference)–Global Forest Coalition, The Wilderness Society, World Rainforest Movement, Global Justice Ecology Project, Via Campesina, the International Youth Delegation and the STOP GE Trees Campaign united today to challenge the UN/REDD definition of forests. Currently the UN considers industrial tree plantations as forests. This is, simply put, an egregious error. Plantations are not forests. Forests are diverse ecosystems and plantations are void of biodiversity. The UN definition endangers Indigenous Peoples, forest dependent people, peasants, small farmers, biodiversity and exacerbates climate change. The groups held a media conference this morning and several actions occurred on the theme of calling on the UNFCCC to change the definition of forests so it distinguishes between native forests and plantations. “We have united to challenge the definition of forest under the UNFCCC to ensure that agricultural tree crops, or plantations are not defined as a forest”, said Gemma Tillack, an international youth delegate and campaigner for The Wilderness Society. “The conversion of native forests to plantations is bad for biodiversity, people and the climate. Human rights, especially women’s rights, are being violated where there are plantations, and they should not be defined as forests. In addition, industrial tree plantations impact the climate–tropical forests and grasslands store significantly more carbon than tree plantations”, said Ana Filippini from World Rainforest Movement and member of the GenderCC Network – Women for Climate Justice. “Schemes such as REDD allow companies to prevent family farmers from using the land to produce the food that is needed to feed their communities and their countries”, said Luis Muchanga of Via Campesina. He continued, “Deforestation, which is a major driver of global warming, is not made by peasants and indigenous peoples, but by large companies that are given the right to convert the forest to tree plantations”. – Forests are defined as ‘a terrestrial ecosystem generated and maintained primarily through natural and ecological and evolutionary processes that are home to most of the world’s biodiversity’. – Plantations are defined as a crop of trees planted and regularly harvested by humans that do not provide habitat for biodiversity. them with industrial tree plantations-which destroys wildlife habitat and displaces indigenous and forest dependent communities. New Zealand is an example of the disaster of tree plantations-and now we are in the process of developing genetically engineered trees for plantations”, he continued. “Commercial release of genetically engineered Franken-trees in plantations poses a very serious threat to the world’s forests and peoples”, added Anne Petermann, Co-Director of Global Justice Ecology Project. “GE insect resistant trees, for example, can contaminate water and soils and the pollen may be toxic to people that inhale it or wildlife that ingest it”, she stated. The groups in this joint press release agree that: “If it is not resolved, and REDD applies this definition of forests, the global community could miss the chance of avoiding dangerous climate change and the 1.6 billion people who depend on forests for there survival will continue to be negatively affected”.